Field guides like the ones featured on this website were pioneered in the 1990s by Field Museum botanist Robin Foster. As he explored tropical forests Robin noticed that field guides for identifying plants and animals were scarce wherever he went. He could teach students to identify tropical plants in the field, but there were thousands more he couldn't reach in person. Wasn't there a faster way to learn about tropical nature? The solution he came up with turned the traditional field guide on its head. Instead of heavy tomes, these were lightweight sheets. Instead of years to make, these took a few days. Instead of black and white, these were full of color photos. And best of all, these new guides could focus on all the places in the tropics for which a traditional field guides simply don't exist. 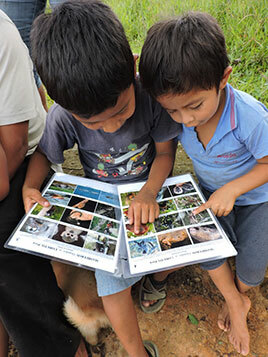 Boys looking at a field guide to the mammals of Amazonian Peru. 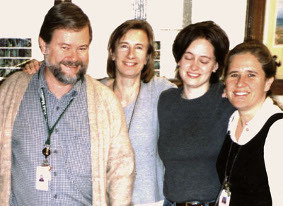 Many of the first field guides Robin made — with a crack team including Heike Betz, Tyana Wachter, Margaret Metz, and Ryan Peters — helped transmit his exceptionally broad knowledge of tropical plants to a new generation of botanists. But the handsome, lightweight guides attracted so much attention from other colleagues that today experts around the world use them to share what they know about the organisms they study. Field guides like these matter because identifying species in the field is a prerequisite for engaging with the natural world—whether it's through research, conservation, or just nature-watching. That's true in indigenous communities, where field guides can help maintain centuries-old knowledge about the fishing, hunting, and gathering that people rely on to live well. And it's true in big cities like Chicago, where field guides play a key role in putting people back in touch with nature.